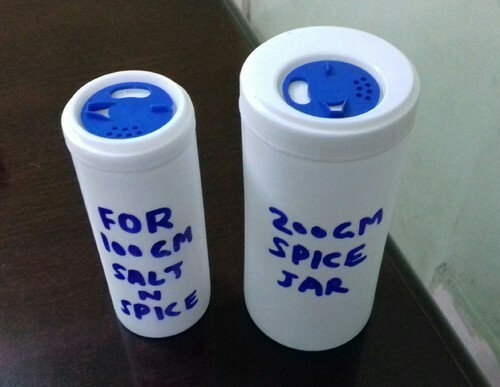 These containers for salt and apices. Cap option is available for three type use. Both are made from food grade plastic. Established in 2004, we Maheshwari Industries are one of the well known manufacturers and suppliers of a wide range of Plastic Jars and Containers. Our comprehensive range of products includes Plastic Jars, Plastic Packaging Jar and Supplement Jar. These are made from best quality raw materials and hence are durable, odor free and long lasting. Our quality controllers ensure that only superior quality raw materials are used in our products that are procured from reliable vendors. They further monitor each stage of the production process to ensure that each and every product is consistent related to quality and performance. They also ensure that the products are in compliance with the international standards of quality. We aim to offer products that not only match the needs and expectations of our clients, but also are at par with the latest market trends. In order to produce the best quality products we have set up a huge modern manufacturing plant spread over a wide area. We have installed all the latest machines and equipments to create world class products using the most advanced technology in the industry. Our team of qualified professionals ensures that each product is well tested and passes the required industrial quality standards before being delivered to the customers. Our sincerity and dedication to our business has helped us gain a strong foothold in this competitive industry within a short span of time.